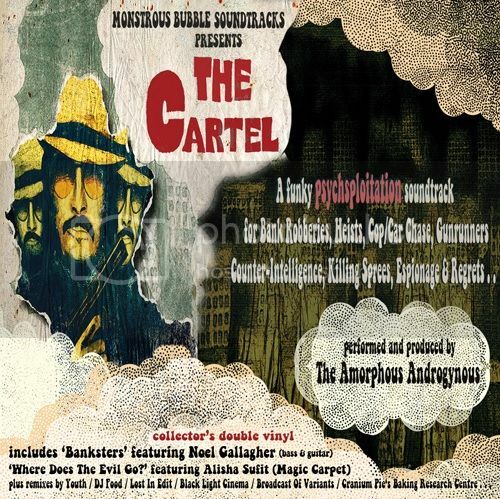 A special collector's double vinyl of ''The Cartel'' by the Amorphous Androgynous exploring psychsploitation (where psychedelia meets blaxploitation) on their ''Monstrous Bubble'' soundtrack series. Features original tracks from The Cartel Vols 1&2 written by the Amorphous Androgynous plus remixes by Youth, DJ Food, Black Light Cinema, Cranium Pie, Lost In Edit and by the Amorphous Androgynous themselves. Also includes ''Where Does The Evil Go ?'' featuring Alisha Sufit (Magic Carpet) on vocals and Banksters which features Noel Gallagher on bass and guitar. Release Date of 21st April. I'm assuming/hoping it'll appear in other formats too at some point. Oh, interesting. Looks a bit Record Store Day-ish with that release date... With fewer tracks it might be easier to digest than the double CD, too. Have a feeling this might be my go-to for Cartel listening. Yeah it would be cool if they could get this out for RSD, at least an initial batch for us freakz. Wait- am I missing something? I can't find anything in this list.. regardless, I'll be up bright and early for that OPN 12"
Will this be for US RSD also, or just UK? I see Broadcast of Variants are doing a remix, that's the Russian lot that Gaz and Brian were working with on the Prime World thingy isn't it. Their website seems to imply there's to be a release called City of Regrets on fsoldigital. Hope this remix album gets a wider release [Insert annual pop at RSD ebay scam]. Can someone please tell where the Broadcast of Variants track is on EBS7? I always assumed it's that incredibly beautiful track near the beginning, the one with that light orchestration and smooth electronics, is that correct? Cause in that case an album full of stuff like that will be definitely for me. To be more precisely: the one that starts around minute 11.00 and ends at 15.30 and is followed by 'flygon' from Archive 7 I always thought is the Broadcast of Variants one. That one is so beautiful. 1. There are two track 1s. 2. Yes, you read track 16 right. Congratumolations to Alex!